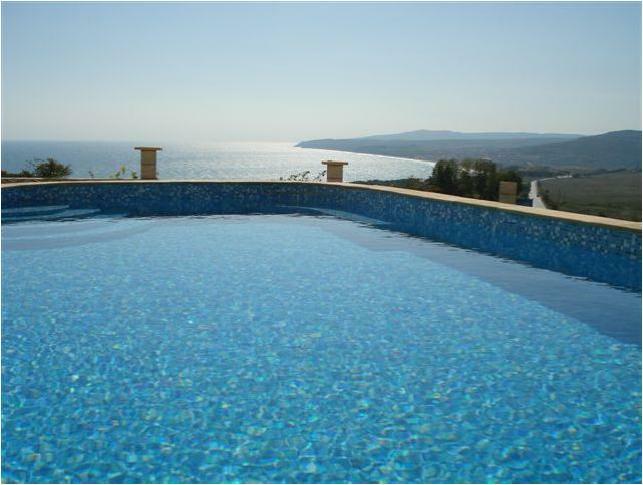 This is a newly-refurbished villa with a fabulous brand new swimming pool, in the peaceful Trakata villa zone which is literally just minutes drive from the beaches of St. Constantine and Sunny Day resorts, and the major attractions in the centre of Varna. The 4-bedroom rental villa can accommodate large families or groups, offering spacious accommodation with all modern conveniences to help you enjoy your holiday. The villa itself has a fully-equipped modern kitchen with dining area, living room with fireplace, TV and air conditioning. Each of the bedrooms are also air conditioned. There are two bathrooms with shower and WC, and off road parking with a garage. It is provided free Wi-Fi in the villa. Outside there is a huge 500sq.m garden, the centre-piece of which is the big brand new swimming pool. You have pool lights for a night-time dip and steps are built into the pool… great for just sitting on to cool off! There are also plenty of sun beds on the large patio area around the pool. The garden is currently being laid to lawn ready for the summer, and there are grape vines and a selection of fruit trees (help yourself!). Finally, you can enjoy al-fresco dining in the outdoor “summer kitchen” which is a covered eating area with a built-in barbeque, tiled food preparation area and even a kitchen sink! The Trakata villa zone is an area on a hillside at the top of Varna that is a popular spot with Bulgarian holiday makers and so has a great selection of restaurants, cafes and bars, all of which are extremely low-priced. The closest of these are about 10 minutes walk from the villa. Also 10 minutes walk away is the Vinitsa Go-Karting circuit, which is an extremely popular local attraction. Other local attractions include the Dolphinarium, Zoo and sea-front areas of the Varna Sea Gardens. Varna City centre can be reached in 15 minutes by taking a local bus (around 30 pence each way) from the end of the road, or by taxi. Varna is great for shopping, enjoying a street caf? lifestyle, and for visiting cultural attractions like the excellent Archeological Museum, Roman remains and the various art galleries. If you want to rent a car to explore further afield we have excellent rates available. This holiday villa is really special, yet is sufficiently economically priced to be within most people’s summer holiday budget and still leave enough spending money to enjoy the entertainments available. Remember with Pride Rentals Bulgaria, we offer all our rental villas and rental apartments, free advance bookings, Guest registration, local information brochure and 24 hour emergency assistance. having just caught up with my work since returning, i would like to just say that we thoroughly enjoyed our stay in the villa and had a totally relaxing time , also your service , when needed, was excellent thanks. we have recommended the villa to a few people already and hopefully we will be looking to visit again next year. Once again ,thanks for one of the most relaxing holdays i have had . And we will hopefully be in contact at the start of the new year to arrange next years trip. I would like to thank you for our great holiday. The time we spent at the villa was great and the children were delighted pool and garden. Thanks for everything.